In 1954, the Federation Internationale de l’Aautomobile imposed a new engine formula on the pinnacle of motorsport. Following a lack of Formula One entrants in 1952, the World Championship was run to 2.0L Formula Two regulations for two seasons. Hoping to stabilize the playing field, the governing body moved to introduce a homogenized 2.5L naturally aspirated engine format, down from the original 4.5L formula dating back to the pre-war era. The clause for 1.5L supercharged engines was similarly adjusted downwards, resulting in an unusually small maximum displacement of 750 cc. Thanks to the muddled regulations, Alberto Ascari became 1952's World Champion in a Formula Two Ferrari 500. 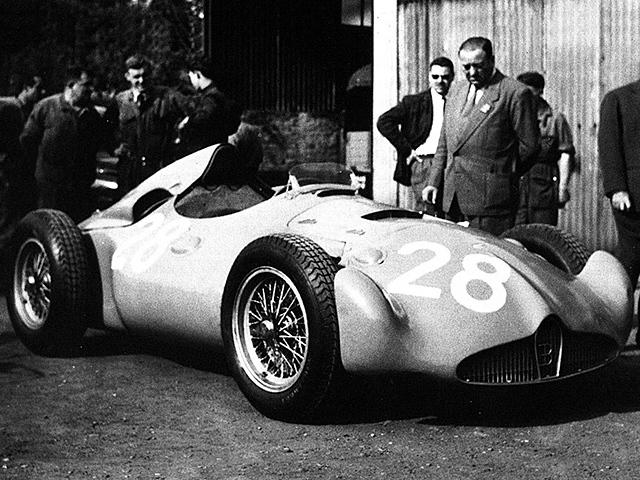 The plan worked perfectly, as Maserati, Gordini, Mercedes-Benz, Ferrari, Cooper, Lancia, Vanwall and Connaught all joined the championship under the simplified rules. Newcomers Mercedes managed to dominate the series in 1954 and 1955 thanks the strength of its driver lineup, as Juan Manuel Fangio became a record-breaking five-time World Champion with support from quick Brit Stirling Moss. Ettore Bugatti at the wheel of what would become his most successful racing car, the 1924 Type 35. For one illustrious marque however, the post-war years hadn’t been so kind. The horrors of World War II had wreaked havoc on Bugatti, formerly the undisputed king of Grand Prix racing. Back in the 1920’s and 30’s, the innovative Type 35 had won over a thousand races in its many guises. By the late 40’s, the factory in Molsheim laid in ruins, and was no longer the company’s property, as Ettore Bugatti’s Italian roots had moved the French government to confiscate his belongings as war reparations. Determined to carry on, Bugatti established a new base of operations in Levallois, a suburb of Paris. There he started work on a new series of cars, including the Type 73 road car, a 73C single seater competition version, an F1-derivative and an unnamed 375 cc supercharged machine. Sadly, Ettore passed away in 1947, before the cars were properly developed. While he was in a nerve-damage induced coma, his property was restored to him in a court decision. He died two months later from the effects of his neural paralysis. The Type 73C never got a chance to shine. Ettore’s death left the company in a shambles once more. Roland Bugatti, Ettore’s 25-year old son inherited the company, and managed to start production of a successor to the famous Type 57, the Type 101. Additionally, Roland planned a return of the famous brand at the top of the motorsport ladder: Formula One. With his father gone, he needed a gifted engineer to design the new racer, as the competition was now more fierce than ever. Thanks to the 2.5L rules the field was much bigger, so the new machine had to be state of the art to beat the likes of Ferrari, Maserati, Lancia and Mercedes-Benz. Luckily Roland managed to find the perfect candidate, with Ferrari-engineer Gioacchino Colombo signing on to develop the new Type 251. The Type 251 featured a rather outdated straight eight engine. First order of business for the team was to create a suitable engine. Colombo obliged by combining two 1.25L twin-cam, twin-spark, four-cylinder engines into a 2.5L straight eight. With a redline of 9000 rpm, the unit was capable of producing 250 horsepower. Considering Bugatti’s history with the engine type, the straight eight made sense, but from a racing standpoint it was relatively backwards thinking. Despite its small capacity, the block was incredibly long, which would severely affect balance and handling in a traditional chassis. However, Colombo wasn’t planning on anything ordinary whatsoever. The Type 251's engine placement was highly eccentric at the time. From a thin and light alloy, he constructed a rudimentary tube frame chassis, and placed the engine smack dab in the middle of it. In an effort to avoid stretching the rear of the car to cartoonish levels, he settled on a transverse engine layout, which instead made the chassis very wide. Extra width would theoretically mean more stability, so the car was given a dramatically short wheelbase to make it more nimble. This was all well and good, but the peculiar layout presented a problem: how the hell was Colombo going to get drive to the rear wheels? Since the engine had a central power take-off, it was no mean feat. The T251's intricate drive system in detail. Colombo’s solution was to use spur gears to transfer power from the center of the engine to the Porsche-designed five-speed gearbox, which was mounted off to driver’s right. From there, the transmission would feed back out into another set of spur gears, which connected to the rear differential, which in turn powered two universal-jointed driveshafts linked to the rear wheels. Surprisingly, this terribly complicated idea seemed to work very well indeed. The finalized engine/drivetrain assembly was then bolted together and fixed directly to the frame rails. With the drive system sorted, the team focused on suspension. In another strange turn, both axles were solid beams. This compared rather unfavorably with the competition, which was already using independently sprung wishbone suspension in the front. The strange counteracting De Dion rear axle up close. The front relied on a simple beam axle, while the rear was a De Dion-type, an advanced form of non-independent suspension. The system was revered for its good traction, reduced unsprung weight and simplicity, but it had one major flaw. The radiator fed its coolant through the frame itself. Rocker arms attached to the wheel hubs connected to long rods which ended in a coil spring on the opposite side of the chassis, serving to push one wheel down into place while the other raised up to clear a bump. At the more agricultural end of the car, the front wheels were suspended by a transversely-mounted leaf spring. But the quintessentially French quirks didn’t end there. Since the engine was in the back, the crew needed to find a way to feed its four twin-choke carburetors with fresh air. Again, the solution was heartwarmingly complicated. With the intake side facing the driver’s back Gioacchino Colombo decided to run flexible hoses from the carbs, alongside the driver to a scoop placed in front of the cockpit. The inlet made it seem like the car was front-engined after all, but nothing could be further from the truth. In the tip of the nose, a large radiator found a home, which was fed coolant through the frame rails. The fuel tanks hung off the side of the car in a precarious fashion. Huge drum brakes were fitted to the 743 kg (1638 lbs) machine, while the small team of engineers was hard at work trying to conjure up a disc brake system. Fitting the engine in the middle of the car caused another issue, as it left no room for fuel tanks. To get around this, two large drums were fixed to the sides of the car, dangerously protruding out into the elements. The Type 251 at the gates of the Molsheim factory, 1955.
he size of the tanks gave the car a very bulbous and ungainly look, as it was immensely wide, but only measured 2280 mm (89 in). The nosecone featured two flared sections intended to streamline the front wheels, while a simulated grille was embossed with the legendary EB -badge. From the front, the car seemed relatively unremarkable, but one the elongate and vented rear was seen, the jig was up. The rear end tapered down into a distinctive teardrop shape, with the two exhausts protruding through two small holes. A raised center section provided a headrest for the driver, who had to gauge his shifts through an open gate, and revved up the engine with an oldschool centrally-mounted accelerator. Slight padding was added to the edge of the cockpit to give some semblance of comfort, but otherwise life in the Bugatti was predictably harsh. The 251 during testing, 1955. Owing to a small budget and faltering road car sales, the Type 251 project was running at a snail’s pace. Nevertheless, the first chassis was ready for testing in the summer of 1955, where veteran racer and double Grand Prix winner Maurice Trintignant, fresh from Ferrari, found the car to be more than a handful. The drastically short wheelbase, unusual engine placement and very high center of gravity coupled to the weird suspension system made the Type 251 perilously nervous. Bobbing and weaving even down the straights, it didn’t take long for the team to realize a slightly longer wheelbase would be a prudent idea. Both 251's in the pits, Reims 1956. The second chassis was ready in time for the car’s Grand Prix debut at the 1956 French Grand Prix. Because of the devastating accident involving Pierre Levegh’s Mercedes at Le Mans the year prior, a number of European Grands Prix had been cancelled, leaving Bugatti with nowhere to race the 251 with relative ease. Both chassis were present at Reims, and Trintignant opted to take out the longer car first. Ironically, the “improved” car turned out to be just as unwieldy as its older brother, which moved the team to fall back on the older, more seasoned machine. Maurice Trintignant had a tough time in the Bugattis at Reims. Given the design’s issues, Maurice’s performance in qualifying was certainly impressive. The cumbersome eight-cylinder was as much as 35 horsepower down on the front-running Lancia-Ferrari D50, which was a horrible disadvantage to have on the long straights of Reims. Seeing as the car was a flyswatter in the few twisty bits as well, Trintignant could be a considered a magician for qualifying 18th in a field of 20. Only Andre Pillet (BEL) in his Gordini T16 and Andre Simon in his private Maserati 250F managed to be even slower. Maurice Trintignant battling Robert Manzon (FRA) and his Gordini T16. Come race day, Trintignant was immediately put in his place. The Type 251 simply refused to handle, and severely lacked power. The Frenchman resigned to muscling the around several seconds off the pace, and saw a number of close calls. At every turn, he could feel the car simply wasn’t up to the job. Unfortunately, Maurice wouldn’t even be rewarded for his tenacity with a respectable race finish. Just eighteen laps in the straight eight’s throttle linkage failed, and the car mercifully slowed to a halt. Trintignant’s ordeal was over, and he jumped right back into his Vanwall for the following British Grand Prix. As Trintignant moved on to greater things, Bugatti’s racing aspirations were finally stomped out. The embarrassing failure of the complicated and expensive Type 251 took its toll on the once glorious company. With sales of the Type 101 faltering as well, Roland Bugatti was forced to close his father’s pride and joy, as the world seemingly didn’t need Bugatti anymore. The Bugatti Type 251 was a hopeful, but massively misguided attempt to re-establish Bugatti as a world-beating marque on the world’s racetracks. Featuring a cumbersome, overly complicated and crucially underpowered drivetrain, an antiquated chassis and suspension setup and quirky but largely useless design features all around, the car simply never had a chance in the cutthroat world of Formula One. Though it managed to reintroduce the mid-engine concept pioneered by the mythical Auto Union Silver Arrows in the late 30’s, it failed to properly integrate state of the art technology in all other aspects of its design. Curiously, even Ferrari’s engine wizard Gioacchino Colombo couldn’t even do better with Bugatti’s undermanned and underfunded squad. As a brand then, Bugatti seemed to be almost destined to fail. The brand would never be seen in Formula one ever again.